Wollaton is a suburb and former parish in the western part of Nottingham, England. Wollaton has two Wards in the City of Nottingham (Wollaton East and Lenton Abbey and Wollaton West) with a total population as at the 2011 census of 24,693. It is home to Wollaton Hall with its museum, deer park, lake, walks and golf course. The remains of Roman kilns, crematoria and coins have been found in Wollaton. The centre of Wollaton village, the original heart of the suburb, has remained relatively unchanged over the past few hundred years and is dominated by the Admiral Rodney public house and the Anglican church of St Leonard dating back to the 13th century. It also features historic cottages, an Elizabethan dovecote and a water pump. The village was incorporated into the City of Nottingham in 1933, with urban development starting shortly afterwards. Most areas of the former parish were built-up by the end of the 1960s. 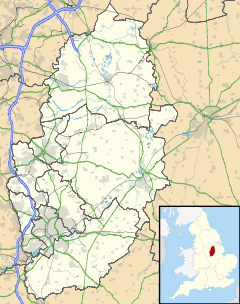 Wollaton proper is entirely situated in the City of Nottingham, although a small part of the Broxtowe borough may be referred to as Wollaton by local people. Other areas of the Nottingham which were not in the original parish of Wollaton may also be described as Wollaton, notably those parts of the former parish of Radford known historically as Radford Woodhouses, and the part of Wollaton Park which was used for housing (usually called the Wollaton Park Estate) which was primarily in the former parish of Lenton. The current city ward boundaries divide Wollaton into Wollaton West, and Wollaton East with Lenton Abbey. It is considered one of the most desirable parts of the city in which to live, with relatively high house prices. This is largely due to the good quality schools (although getting a place is troublesome), traditional public houses and good access to the M1 via the A52 to the South and the A610 to the North. The suburb's main shopping area is located along Bramcote Lane about a kilometre west of the historic centre. Most of the businesses are local family-run shops, although recently both small co-op and Sainbury's stores have opened. Also in Wollaton are a small cluster of shops at the Crown Island (a major roundabout nearer the Nottingham city centre) which includes a post office, florist and Pizza Hut delivery. The largest supermarket in Wollaton is Waitrose, which is on Trowell Road, which until 2015 was a Co-Op. Wollaton itself stretches across a large area, from Torvill Drive and Russell Drive near the Bilborough area in the north, down to Bramcote Lane, Woodbank Drive and Appledore Avenue in the south, stretching as far south as the woodland now called 'Bramcote Ridge'. West to east it stretches from Trowell Moor and Balloon Woods on the west, across to Sutton Passey's Crescent and the former gatehouse to Wollaton Park, Lenton Lodge on Derby Road in the east. The local Middleton Primary and Nursery School along with Fernwood Juniors', Fernwood Infants' and The Fernwood School  are some of the best performing schools within Nottingham City and even the UK. The three Fernwood schools are the a family of academies all within close proximity. The nearest sixth form college for post-16 education is Bilborough College in Bilborough. Also in and around Wollaton are Southwold Primary School and Firbeck Academy, a school for the deaf and aurally impaired. The edge of Wollaton is also home to the Martin's Pond Local Nature Reserve which is jointly maintained by Nottingham City Council and Nottinghamshire Wildlife Trust. The lake is maintained by Wollaton Piscatorial Club which provides a haven for plant and animal life and a wide variety of course fishing (including some rarer species). Wollaton Park has also been host to many large events and concerts, including the once annual City in the Park events which ran during the 1990s and featured popular pop acts of the time such as Peter Andre, Five, Gina G and The Bangles. A new festival, Splendour in Nottingham, was relaunched in 2008 and is slowly developing into a popular festival, with large names such as Calvin Harris and The Pet Shop Boys performing there in 2010, and Dizzee Rascal in 2012. The park also hosts the city's annual War Veterans Memorial Weekend, being one of the largest memorial events outside London and including fly-overs by wartime aircraft. Also, the park hosts other major annual events such as cross-county running championships, dog shows, steam shows and the annual Nottingham Motor Show. The Park is also where the sledgers of Nottingham descend whenever there is snowfall, taking advantage of the park's large hill. Wollaton is also noted for the existence of one of the earliest recorded railway lines in the world, the Wollaton Wagonway. The wagonway ran between nearby Strelley and Wollaton. Horse-drawn coal wagons travelled to their destination on wooden railway lines. The wagonway was completed in 1604, built by Huntingdon Beaumont working in partnership with the second occupier of Wollaton Hall, Sir Percival Willoughby. Wollaton does not have a railway station, even though the line from Nottingham to the Erewash Valley line passes through the area. The churches jointly publish a monthly magazine called Link. The Wollaton Dovecote Museum is a little-known museum on Dovecote Drive. The dovecote was built in 1572 by the Willoughby family. Coal has always been an important presence in the suburb and revenue from Wollaton Colliery was a major source of income to the Willoughby family, who built and owned Wollaton Hall up until the 20th century. The colliery closed after in 1965 and employment today is primarily in the service, university and public sectors, with many of the local residents commuting to work in the Nottingham and Derby area. The Wollaton. owned by the Moleface Pub company. Wollaton Hall and Bramcote Football Club (founded 1984) is a FA Charter Standard Club with the aim of providing a safe and supportive environment where boys and girls between the ages of 6 and 18 can enjoy playing football. Formerly based at Wollaton Park, the club is now based at Highfields Park. Some of WH&BFC teams play their home games at nearby Moor Lane,Bramcote. Most teams train at Fernwood Comprehensive School. The club currently has over 300 registered players and teams compete in the Notts Ladies & Girls League, the Young Elizabethan League, Notts Youth League and Derby City League. Wollaton FC were formed in 1954 and play at Wollaton Sports Association Ground sharing the ground with Wollaton Cricket Club. The Club is sited on land that was sold to the village for sports and recreational activities by the Middleton family just after the 2nd World War. The Club Badge depicts the Elizabethan architecture of Wollaton Hall. Originally in the Midland Amateur Alliance, Wollaton joined the Notts Alliance in 1990. The club enjoyed a long and successful spell in the MAA and the 3rd and 4th teams still play in that League. Season 2004/5 saw Wollaton become one of the founder members of the Notts Senior League. ^ "City of Nottingham. Wollaton West ward population 2011". Neighbourhood Statistics. Office for National Statistics. Retrieved 18 April 2016. ^ "City of Nottingham. Wollaton East and Lenton Abbey ward population 2011". Neighbourhood Statistics. Office for National Statistics. Retrieved 18 April 2016. ^ "GB Historical GIS / University of Portsmouth, Wollaton AP/CP through time Census tables with data for the Parish-level Unit, A Vision of Britain through Time". Retrieved 13 November 2013. ^ "Google". www.google.co.uk. Retrieved 2017-02-03. ^ "Home - Fernwood Junior School". www.fernwood-inf.nottingham.sch.uk. ^ wearebase.com, Base,. "Service 30 on Pink Line". www.nctx.co.uk. ^ wearebase.com, Base,. "Service 35 on Orange Line". www.nctx.co.uk. Archived from the original on 15 March 2018. Retrieved 11 March 2018. ^ wearebase.com, Base,. "Service 35A on Orange Line". www.nctx.co.uk. ^ wearebase.com, Base,. "Service N28 on Pink Line". www.nctx.co.uk. ^ wearebase.com, Base,. "Two service by TrentBarton". www.trentbarton.co.uk. ^ wearebase.com, Base,. "Locallink Service L10 ran by Nottingham Community Transport" (PDF). www.ct4n.co.uk. ^ "Dovecot". BBC. Retrieved 19 January 2013. ^ "Admiral Rodney - Wollaton Nottingham Nottinghamshire". www.pub-explorer.com. ^ "Hemlock Stone Ember Inn - Wollaton Nottingham Nottinghamshire". www.pub-explorer.com. ^ "Wheelhouse - Wollaton Nottingham Nottinghamshire". www.pub-explorer.com. ^ Co, Moleface Pub. "Moleface Pubs - Restaurants in Nottingham". thewollaton.com. ^ "Toby Carvery Wollaton Park - NOW CLOSED". Toby Carvery. ^ "Wollaton Football Club 1954". Archived from the original on 3 March 2016. Retrieved 23 June 2008. Smith, R S (1989), Early Coal Mining Around Nottingham 1500 - 1650, University of Nottingham (out of print) . Marshall, P (1999), Wollaton Hall and the Willoughby Family, Nottingham Civic Society . Wollaton: historical and genealogical information at GENUKI. This page was last edited on 12 April 2019, at 09:56 (UTC).